Background: The healthcare is a highly regulated sector as it serves billions of population globally. The two imperative pillars of this sector are pharmaceutical industry and health regulatory authorities. While the industry acts as a supplier in this sector, regulators provide governance to ensure quality, safety and efficacy of the healthcare products. Even though organizational objectives of these two stakeholders are different, the by and large goal is to improve health outcomes for populations. Both these entities are confronted by an assortment of challenges. Objectives: This study aims to draw attention towards such pain points and the potential of collaboration and coordination efforts between these entities to mitigate these challenges. The industry faces challenges that are driven by business needs and regulations. The major challenges faced by the regulators are driven by the needs to ensure the safety, quality and efficacy of health care products. Some of these challenges may have an overlap. Market scenario, patent/ exclusivities/return on investment issues, development costs, cost containment, quality and GMP, scientific discovery productivity, novel therapies and technology, regulatory framework, counterfeiting, supply chain challenges, Product life cycle management (PLM), patient centricity approach, resources and financial constraints, process issues, protection of the public health, contemporizing and growth of regulatory framework, political scenario in the country/region, unethical clinical trials and research, healthcare policies, citizen participation, pharmacovigilance and safety measures comprise a non-exhaustive list of challenges that confront industry and regulators. Health authorities need to partner amongst them and with Pharmaceutical industry and continue to innovate for novel ways of working to conquer these challenges. Organizations of international/ regional repute are known for their unique contribution in regulating the healthcare sector. These bodies have helped to improve access to safe medicines more widely by harmonization of drug quality, safety, and efficacy standards. These coordinated efforts have the potential to reduce the numbers of challenges that confront the healthcare sector. Conclusion: The pharmaceutical industry and health regulators need to partner to achieve common goal of healthcare. There is a growing need for these parties to come together on common platforms and collaborate. The success of the strategies and approaches intended to deal with these challenges depends upon strategic-level leadership and new ways of collaborative working, which creates a room for potential synergies. Keywords: Collaboration, coordination, partnership, regulators, pharmaceutical industry, challenges, solutions, confront, harmonization, healthcare. 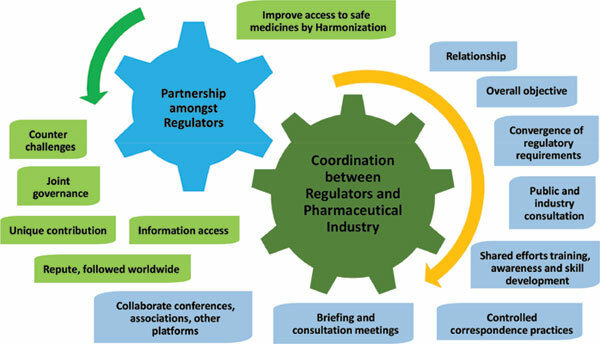 Keywords:Collaboration, coordination, partnership, regulators, pharmaceutical industry, challenges, solutions, confront, harmonization, healthcare. Abstract:Background: The healthcare is a highly regulated sector as it serves billions of population globally. The two imperative pillars of this sector are pharmaceutical industry and health regulatory authorities. While the industry acts as a supplier in this sector, regulators provide governance to ensure quality, safety and efficacy of the healthcare products. Even though organizational objectives of these two stakeholders are different, the by and large goal is to improve health outcomes for populations. Both these entities are confronted by an assortment of challenges.